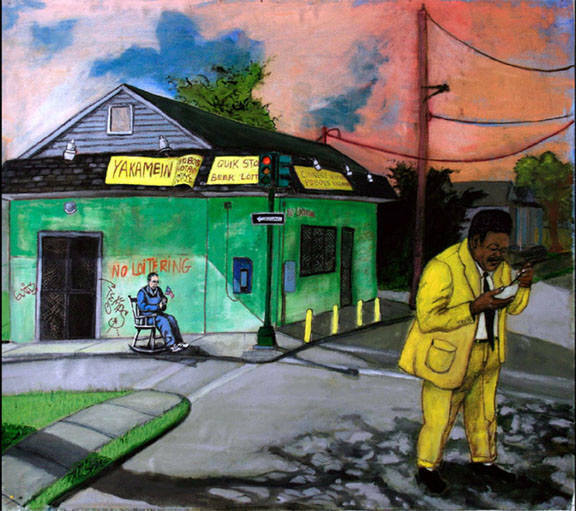 Fats Domino is a central image characterizing several works created by mixed-media artist Gina Phillips, which are exhibited at the Ogden Museum of Southern Art through January 27. One painting depicts the New Orleans rhythm and blues musician rising gloriously from the dappled surface of the industrial canal. Wearing a bright green suit and a narrow tie, his arms are raised in celebration, his head thrown back with a smile. Though she has not yet met Mr. Domino, Phillips’ neighbor grew up with him in the Lower Ninth Ward and tells stories. 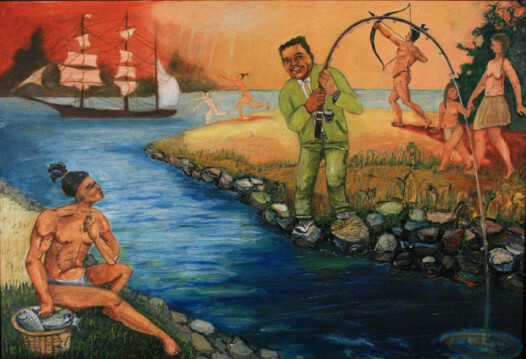 “Young fats goes Fishing with the Natives,” part of Phillips’ Fats Domino series. “He became a symbol of the plight of this neighborhood,” said Phillips whose shotgun house sits near the intersection of the canal and the Mississippi River not far from the place where the levee wall ruptured, flooding the neighborhood. “He’s this character transcending time and space,” she said, referencing another work, wherein Domino is fishing in the canal, alongside Native Americans. A native of Kentucky, Phillips came to New Orleans in 1995 to attend graduate school at Tulane University. Her grandmother, a self-taught artist, inspired her at an early age and figures in her paintings. Phillips learned from her that any material may be used to create art. Her early narrative works therefore included wood, paint, metal and fabric. Since acquiring a free-motion, thread-drawing machine, Phillips’ newer art pieces intersperse swatches of fabric and thread in an appliqué process over the paintings. The results are gigantic quilts, brilliantly colored and richly textured. “Facing Leaner Times Ahead, Fats Eats a Nourishing Bowl of Yakamein,” another painting in Phillips’ Fats Domino series. She was introduced to the Lower Ninth Ward when Preservation Resource Center targeted the historic neighborhood of Holy Cross through Operation Comeback. The U.S. Housing and Urban Development Department auctioned her house in 2003. “I didn’t even go into the house. I bid on it,” Phillips recalled. Her plot of land has a magnificent view of the levee, Crescent City Connection and downtown New Orleans. Since then, she purchased the empty lot next door. “This spot, this is it,” she said. Geography is reflected throughout her current exhibition. Tug boats, warehouses, water towers, cranes, pelicans, Navy ships, oaks, sunflowers and even the Chalmette battleground appear in different tableaus. There is a definite sense of place. After Katrina, her neighbors became her best friends. “I never experienced this kind of community before,” she said. Phillips’ work is included in the private and public collections worldwide, including the University of Kentucky, Lexington; New Orleans Museum of Art; Frederick R. Weisman Art Foundation, Los Angeles; The House of Blues Collection; NASA; and the Ogden Museum of Southern Art. During The Ogden’s After Hours on Thursday, January 16 and 23, Phillips will conduct tours of the exhibition and engage adults (18+) in an art-making workshop. At 3 p.m., Saturday, Jan. 18, a closing party will be open to the public.